The European Commission has decided that Arkema (formerly Atofina), Degussa, ICI, Lucite and Quinn Barlo (formerly Barlo) have violated the EC Treaty rules’ ban on restrictive business practices (Article 81) by participating in a cartel on the market for acrylic glass, used inter alia for vehicle lighting and dashboard instruments. Lucite International is the new, chosen name for the world's leading methacrylates supplier as from May 2002. Foster Wheeler Ltd. announced today that its UK subsidiary, Foster Wheeler Energy Limited, and its Singapore subsidiary, Foster Wheeler Asia Pacific Pte. Ltd., both of which are part of its Global Engineering and Construction group, have been awarded a reimbursable engineering, procurement and construction (EPC) contract by Lucite International Singapore Pte. Ltd. (LISPL) for a new methyl methacrylate (MMA) manufacturing facility to be built on Jurong Island, Singapore. Lucite International is one of the world's leading manufacturers of acrylic products and owner of the renowned Lucite(R) and Perspex(R) brands. Foster Wheeler has already completed the basic engineering design for this 120,000 tonnes per annum plant. Lucite International has recently marked the start of construction of the new plant with a groundbreaking ceremony held in Singapore in mid-July 2006. The plant is scheduled for commissioning in 2008. ICI manufactured the first commercial batch of Methyl Methacrylate, which is the basis of the acrylics business. Since then ICI has been in the forefront of acrylics manufacturing, research and technology worldwide. 1936 MMA manufactured at Billingham, England. 1940 PERSPEX TM sheet manufactured at Darwen and Rawtenstall. 1961 Polymer manufactured at Billingham, England. Polymer and PERSPEX manufactured at Rozenburg. 1978 KMC Joint Venture started up (15kte)　ICI expanded beyond its European base and started Taiwanese joint venture to produce MMA. This plant was further expanded in the early 90s. 1989 KSH acquired - a US Extruded Sheet business - providing additional production capacity and market position. Monomer 8 + SAR approved at Billingham, England, to bring capacity to 180kte. 1990 ICI purchased a speciality Cast Sheet plant located at Clairvaux, France. Continental Polymers Inc. acquired, further strengthening ICI's North American business. 1993 The composites plant and Technical Service facility opened in Ibaraki, Japan. 1994 Purchase of Dupont's Acrylics Business in USA. 1995 MMA expansion at Beaumont, USA approved. 1995-96 Thai Poly Acrylic sheet operations at Bangkok, Thailand acquired. Doubling of Rozenburg, Holland capacity announced. The Lucite Center - our US Operations and Research center - in Memphis, opened. 1998 SAR business in Delaware, USA sold to Uniroyal Technology. Solid reagent chemicals business sold to DuPont and closure of manufacturing facility. 1999 Business is acquired by Charterhouse Development Capital and Ineos Capital Finance. Ineos has partnered with Charterhouse Development Capital to fund the purchase of ICI Acrylics for £505m ($837m). The Board of INEOS Acrylics has approved several key expansion projects for its U. S. Operations following a strategic review of the business. Lucite International, the world's largest producer of methyl methacrylate (MMA), said on last Friday that it has an option to expand the capacity of its planned new plant in China to 150 000 tonne/year. The 93 000 tonne/year facility at Caojing near Shanghai, which is due onstream by mid 2005, is being built at an initial cost of $100m (Euro87m), said Lucite. Feedstock for the new plant will come from the 900 000 tonne/year cracker which is being built at Caojing by Secco, a joint venture between BP, Sinopec and Shanghai Petrochemicals Company (SPC). Lucite International Inc, part of the Lucite International group of companies, and Plaskolite Inc jointly announce the sale of Lucite International’s facilities in Olive Branch, Mississippi and Monterrey, Mexico to Plaskolite Inc.
“This transaction signifies a new phase in our long-term relationship with Plaskolite. We aim to create significant opportunities for productivity improvements, which will enable us to address evolving market conditions in North America and align the needs of our customers with the Company’s long-term objectives of efficient profitable growth,” said Ian Lambert, Global CEO of Lucite International. Lucite International will continue to support Plaskolite as a supplier of methacrylate materials as it continues to expand the acrylic market through operating efficiencies and new product development. The management teams of both companies expect the transaction to be completed by 1 August 2007. Lucite International is selling its continuously processed acrylic sheet division with two plants in the USA and Mexico to Plaskolite. Plaskolite was one of the founders of the extruded acrylic sheet industry in the United States nearly 60 years ago and remains the only privately-held, family-owned business in the industry. Perspex (MMA) producer Lucite International is considering a sale or public flotation and investment banks Deutsche Bank and Merrill Lynch are to assess the options. Mitsubishi Rayon（提携） is tipped as a potential purchaser with Dow Chemical （R&H 買収）, BASF and Asahi Kasei also in the running. A sale is anticipated to yield some £1·3 billion. Lucite, the maker of acrylic products ranging from bus shelters to McDonald’s golden arches, has received two $2bn (£1.1bn)-plus takeover approaches from Japan and Saudi Arabia seeking to pre-empt next month’s opening of its $500m (£282m) plant in Singapore. The Southampton-based company, owned since 1999 by UK private equity group Charterhouse Capital Partners, has opened its books to Japanese rival Mitsubishi Rayon and a Saudi consortium of rich investors and Saudi International Petrochemical Company, Sipchem. Japanese chemical giant Mitsubishi Rayon close to acquiring British-based Lucite, maker of acrylic-based goods such as Perspex, for about £1bn. Lucite was downgraded by Moody's to a deep junk Caa1 credit rating last month and the deal was contingent on obtaining a debt-covenant waiver from creditors, the people said. Lucite's creditors, chiefly beleaguered loan-market investors, were prepared to overlook covenant problems because they will now get repaid at face value instead of sitting on heavy mark-to-market losses. That frees up cash to reinvest. Leveraged loans suffered their steepest-ever losses in October and Europe's top 40 leveraged loans are bid at 65.8 percent of face value, according to RLPC data. "The problem with a lot of companies bought by private equity is that there isn't a natural strategic buyer," this person said. "The ones where they were outbidding each other -- those are the ones that are going to be in difficulty." Tokyo-based chemicals and plastics company Mitsubishi Rayon is paying $1.6 billion for Lucite, which is 81.6% owned by U.K. private equity firm Charterhouse Capital Partners. The purchase is supported by borrowings from the company's shareholder Mitsubishi UFJ Financial Group, Japan's biggest bank by assets. The funding commitment helped propel Mitsubishi Rayon ahead of rival bidder Saudi International Petrochemical Company, or Sipchem, after due diligence, one person said. Sipchem was bidding jointly with Saudi Arabian investment company, Jadwa Investment. Mitsubishi Rayon has had intermittent talks with Charterhouse about Lucite ever since the private equity firm bought into the company in 1999. Its pursuit has been based on sound strategic rationale. Speaking at a news conference earlier Tuesday, Mitsubishi Rayon president Masanao Kambara said the deal was the "opportunity of a decade". Tuesday's sale was not the result of a full-blown auction, unlike a previous attempt to sell Lucite in 2006. At that time, the private equity investor was looking to sell out of the business for around $2 billion to $2.5 billion, people said. Lucite International (China) Chemical Co., Ltd. (Lucite China) must spin-off its annual capacity by 50%, to one or more non-related third-party purchaser(s), the spin-off period is in the coming five years. In the next five years the third-party purchaser has the right to buy the MMA produced by Lucite China, and the price will be just the costs (without any profit), and the costs must be verified annually by an independent auditor. The spin-off should be completed within six months after the transaction completed. If Lucite has reasonable causes for extension the period, the Ministry of Commerce has the right to extend for six months (“spin-off period”). From the transaction completion to the completion of the “capacity spin-off” or “Total spin-off” ("the period of independent operating"), Lucite China and Mitsubishi Rayon Company should operate the MMA business separately; they should have their own management and board members. In "the period of independent operating", two companies should continue to compete with each other on MMA selling in China, the two companies must not have the mutual exchange of information on the pricing in China market, customers and other competitive information. In "the period of independent operating", two companies will be punished if there are any violation of the above commitments, and the total amount of punishment will be between RMB 250,000 to 500,000, and the specific amount will be determined by the Ministry of Commerce in accordance with the impact on China market. 1. In China, the new acquisition of MMA monomer, PMMA polymer or plastic plate manufacturers. 2. In China, the new projects of MMA monomer, PMMA polymer or plastic plate plants. This Decision is effective since the date of announcement. The Board of Lucite International Group Limited is delighted to announce that the world's first Alpha plant has begun producing methyl methacrylate (MMA). The new 120,000 plant is located on Jurong Island in Singapore and will supply customers in Asia, where demand for MMA has grown most rapidly. Alpha technology offers 40% savings over existing technologies in both construction and production and has the potential to revolutionise the cost base of the MMA industry. Lucite International's second Alpha plant, which is already in an advanced stage of planning, will be designed with a 250,000 tes capacity. Degussa is a newly formed, multinational corporation aligned to high-yield specialty chemistry. As such, speed, flexibility, flat hierarchies and close proximity to customers and markets characterize it best. Responsibility for operational business is held by 23 business units gathered under six divisions (Health & Nutrition, Construction Chemicals, Fine & Industrial Chemicals, Performance Chemicals, Coatings & Advanced Fillers and Specialty Polymers). Degussa's management philosophy "As decentralized as possible, as central as necessary" expresses the significance attached to the business units, which act as "entrepreneurs within the enterprise". They are supported by six global service units (accounting, human resources, information technology etc.) and ten regional service units, that compete with outside providers. The Dusseldorf Corporate Center and its satellite operation in North America provide strategic control functions with a staff of about 100. When pharmacist and chemist Dr. Otto Rohm discovered the efficiency of tryptic enzymes for bating animal hides in 1907, the invention of the tannery bate Oropon® was only a step away. At last, it was possible to replace the conventional, extremely unhygienic dog dung bate with a scientifically based process. In order to put his invention to commercial use, Dr. Rohm and his friend, merchant Otto Haas, founded Rohm & Haas GmbH in Esslingen, Germany, in 1907. This is the ancestor of our present company. In 1909, Haas traveled to the United States to establish a branch office in Philadelphia, Pennsylvania. The company will be a joint venture between the 100% Degussa subsidiary Rohm GmbH & Co. KG, the Unichem Group and ZAO Orgsteklo JSC, a long-standing Russian partner of Business Unit Plexiglas. The planned capacity of several thousand tonnes is intended to meet demand on the Russian market and in the CIS. Degussa intends to invest into a methacrylate "Verbund"
Degussa AG, Dusseldorf, intends to construct a facility in China for manufacturing the standard monomer methyl methacrylate (MMA) as well as various methacrylate specialties. The world-scale facility could come on stream in 2008/2009. "Our plans for an MMA facility in China underscore our global growth strategy. This facility would see us consolidating our position as a leading global manufacturer of methacrylates", emphasizes Dr. Manfred Spindler, Head of the Degussa Specialty Polymers Division. MMA and specialty monomers are components used in a wide variety of applications, such as scratch-proof paints, top-quality adhesives and modern interior trims for cars. As the global market leader in specialty chemicals, Degussa uses its innovative products and system solutions to create something indispensable for its customers’ success. It’s an approach we sum up in our claim of “creating essentials”. In fiscal 2004 its 45,000 employees generated sales of 11,2 billion euros, and operating profits (EBIT) of 965 million euros. Under the name AVENEER, Evonik Industries has developed a new, pioneering manufacturing process for methyl methacrylate (MMA). 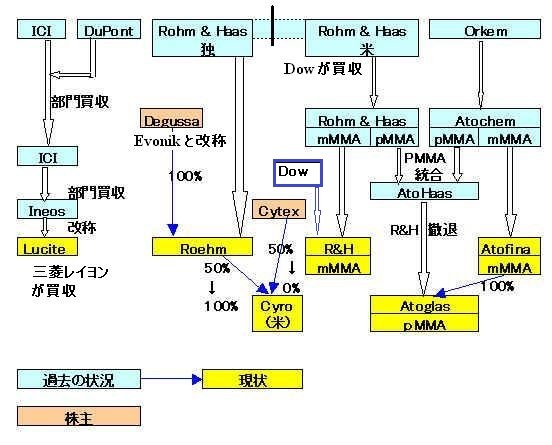 In addition to the site currently under construction in Shanghai with significantly further developed C4 MMA technology, a significant technology advance could also be achieved now in the classic ACH sulfur process. Thanks to significantly improved efficiency in the use of “raw materials and energy” with regard to all established MMA processes, Evonik views itself as a future cost leader with the new process in this field. Like the traditional ACH sulfur process, AVENEER is based on the starting materials ammonia, methane, acetone and methanol - without the additional use of sulfuric acid. The omission of the reprocessing of sulfuric acid, which has now become unnecessary, both saves costs and conserves resources. “We use fewer raw materials for manufacturing, and can thus offer our customers the security of continuing to drive competitive MMA prices in the future,” explains Hetzke. In the conventional process, which accounts for about 60% of world capacity, ammonia and methane are reacted together to form hydrogen cyanide, which is further reacted with acetone to make acetone cyanohydrin. Sulfuric acid converts the cyanohydrin to methacrylamide sulfate, which is then treated with a methanol/water mixture and heated to form MMA and ammonium bisulfate. For every tonne of MMA produced, the conventional process creates around 1.2 tonnes of ammonium bisulfate by-product, which has to be disposed of. The key to the Aveneer process is an inorganic catalyst that remains in the process loop and replaces the sulfuric acid. Hetzke said catalyst life was still being evaluated, but the expectation was that it would be more than a year before removal and regeneration are necessary. Aveneer's main benefit is its elimination of the sulfuric acid recovery, handling and storage equipment, which accounts for a significant portion of capital costs and about half the energy consumption of a conventional plant. Ammonia consumption is also reduced, and ammonium bisulfate by-product is eliminated. Aveneer can be applied to new plants and the conversion of acetone cyanohydrin ones. Evonik is confident that pilot plant testing has reached a stage where the process can be scaled up. Basic engineering will start next year on a commercial plant with possible start-up in 2012. A joint partnership of Cytec Plastics Inc. (a subsidiary of Cytec Industries Inc.) and Rohacryl, Inc. (a subsidiary of Rohm GmbH & Co. KG, Darmstadt, Germany). Formed on July 1, 1976, CYRO Industries is a joint partnership between Cytec Industries Inc. (formerly Cyanamid Plastics Inc.) and Röhm GmbH & Co. KG, a subsidiary of Degussa AG, based in Germany. 115,000 metric tons of annual manufacturing capacity will be added in 2002. The existing Deer Park plant has existing capacity of 360,000 metric tons per annum (tpa) and is the largest MMA facility in the world. 1990 On 1st January the unit is transferred to the Atochem group (Elf group) to become a division, Altuglas, a single brand name for acrylic sheets and resins. 1992 Creation of a Joint Venture with Rohm and Haas: AtoHaas. in the Asia-Pacific region, AtoHaas Pacific is held in equal shares. 1995 Marketing of Tuffak Polycarbonate sheets by AtoHaas. 1998 Elf Atochem buys the Rohm and Haas shares: AtoHaas becomes 100% Elf Atochem and changes name to Atoglas. 1999 Elf Aquitaine and TotalFina merge. 2000 With the merger of the two groups TotalFina and Elf Aquitaine, Elf Atochem takes the name Atofina. All chemical activities of the new TotalFinaElf group are reorganized under the name Atofina. Atoglas produces clear and tinted resins for injection moulding, injection blow-moulding, extrusion and coextrusion. Altuglas®, Oroglas® and Goldglas® in the rest of the world. We also produce and sell Implex® Impact Acrylic Sheet and the Tuffak® Polycarbonate Sheet family of products. Europe, producing 100,000 metric tons a year for all products combined. This plant has a unique continuous resin polymerisation process. To date, the performance of this technique remains unmatched. ATOFINA Chemicals, Inc., through its Atoglas Division, assumed ownership of the Kensington facility in 1998. The plant has been operating in Connecticut since 1975 and currently employs 80 full-time people. The Kensington facility produces acrylic sheet products such as Plexiglas® and Implex® and polycarbonate sheet products such as Tuffak®. The Atoglas Division manufacturing plant in Bristol, Pennsylvania began making Plexiglas® acrylics (or resins) in the 1940's as a division of Rohm and Haas Company. The operation continued in October, 1992 after the formation of AtoHaas, when Rohm and Haas and Elf Atochem S.A. became joint venture partners. As of June 5, 1998 the Bristol plant is fully owned and operated by ATOFINA Chemicals, Inc. (formerly Elf Atochem North America, Inc.) and employs approximately 135 people. The Bristol plant manufactures a variety of acrylic molding resins with properties like impact resistance and superior optics. The Atoglas Division manufacturing plant in Louisville began making Plexiglas® acrylics (or molding resin) in 1968 as part of the Rohm and Haas Company. It is located 1/2 mile south from the Rio Grand, the US/Mexican border, in the city of Matamoros in the state of Tamaulipas, Mexico. The name of the Mexican company is Maquiladora General de Matamoros S.A. de C.V. (MGM for short). The name means General Tolling Company of Matamoros. It started operations in 1987, producing Plexiglas® acrylic sheets, as a wholly owned subsidiary of Rohm and Haas Company. MGM manufactures two different families of products: acrylic sheets, using the cell cast process; and plastic modifiers, using the bulk process. Atoglas acrylic resin, previously sold in these regions under the trade name Oroglas®, will now be marketed under the trade name ALTUGLAS®. In North and Latin America, acrylic resin and sheet produced by Atoglas have been marketed for over 60 years under a single trade name: Plexiglas®. The Plexiglas® name will be maintained in this part of the world. The Atofina subsidiary Atoglas will increase production of polymethylmethacrylate (PMMA, acrylic plastic) at its Jinhae, South Korea site in May 2004. The site today has capacity for 17,000 tons of acrylic resin as well as lines for the production of acrylic and polycarbonate sheet. The new capacity of the site will reach approximately 40,000 tons of PMMA resin. Atofina subsidiary, Atoglas announced plans to re-organize its acrylic sheet business, Friday by shifting its production from two sites into one. Atoglas plans to close its Leeuwarden site in the Netherlands by September 2006, and simultaneously focus production at new capacities in Carling-Saint Avold, France. The Atofina subsidiary Atoglas intends to invest into new capacities in Carling-Saint Avold (France) by September 2006, and to concentrate on this site cast acrylic sheet production currently split between two sites in Europe. The Leeuwarden site (Netherlands) would close on the same date. The management met with the Dutch trade unions today. Negotiations will relate to the terms of the redundancy plan and the support measures to be made available for this reorganisation project. Ireland’s Quinn Group has confirmed plans to build a E150m methylmethacrylate plant in Leuna, near Leipzig, Germany. Capacity is planned to be around 100,000tpa and production is expected to begin in 2008. The investment will be subsidised by the Saxony-Anhalt regional government. Approximately 100 jobs will be created. The move will create some vertical integration for Quinn: its plastics division is a leader in PMMA sheet products. The plant, located at the heart of the former East German chemicals industry, will use an environmentally-friendly process of continuous direct oxidation and esterification. Quinn Plastics is Europe's foremost supplier of transparent plastics sheet. We provide cost-effective solutions for almost every application where transparent or translucent sheet is required. Quinn Plastics is a member of the Quinn-Group of companies. The Quinn Group recently acquired Barlo Group taking it into private hands. Quinn Group is owned by entrepreneur Sean Quinn, and is one of Ireland’s most successful companies with interests in construction, container glass, insurance services, real estate, and hospitality - and since the Barlo acquisition - in radiators and plastics. Quinn Plastics will be the new name for Barlo Plastics, starting from January 1st 2005, completing the acquisition and fully integrating the plastics business into the Quinn Group of companies. Quinn Plastics, formerly known as Barlo Plastics, is Europe’s foremost supplier of transparent plastic sheet. Key products are: QUINNTM XT (extruded PMMA), QUINNTM CAST (cast PMMA), QUINNTM PC (Polycarbonate), QUINNTM PS (Polystyrene), QUINNTM PETG, QUINNTM SAN (Styrene Acrylo Nitrile), QUINNTM HIPS (extruded Impact Modified Polystyrene) and QUINNTM SPC (multiwall Polycarbonate). Quinn Plastics has operating facilities in Germany, the UK, Spain, France, Slovakia and the Czech Republic as well as sales and support operations in all major European countries. Headquartered in Derrylin (Northern Ireland) the privately owned Quinn Group is one of Ireland’s most successful companies with a proven track record of success in the diverse industries it has ventured into: cement and concrete products, container glass, general insurance, radiators, plastics and real estate. Further expansion of methyl methacrylate production using its new Alpha technology has begun at Lucite International. With construction of its first plant in Singapore now underway, Lucite says it is planning plants 2, 3 and 4 - although it is not saying yet where they will be built. Alpha 2 will be a 250,000 tonnes plant - Alpha 1 is 120,000 tonnes - and is expected to be in full scale production by 2011. The Alpha process, revealed in 2004 is reckoned to cut the cost of making MMA by 40 per cent, using ethylene, methanol and carbon monoxide feedstocks instead of acetone, HCN and isobutylene. The UK's Lucite has started construction at its first methyl methacrylate (MMA) plant, a spokesman for the company's PR company said Wednesday. Degussa AG, Dusseldorf, plans to construct a major Verbund production (integrated production network) in Shanghai to manufacture methyl methacrylate (MMA) and methacrylate specialties. The Degussa Supervisory Board has now given the go-ahead for this facility to be constructed. The investment volume for the entire plant including all intermediates is around 250 million euros, making it Degussa’s second-largest single investment. The world-scale facility is scheduled to come on stream in 2009 on completion of the construction phase, which should last approximately two years. Once all the approvals have been obtained from the Chinese authorities, Degussa will construct an MMA facility with an annual capacity of 100,000 tonnes, which will practically all be processed into highly-refined methacrylate specialties and polymers. These are components used in a wide variety of products, such as LCD screens, scratch-proof paints, top-quality adhesives, modern interior trims for cars and numerous plastics applications. The facility will be built at Degussa’s multi-user site at Shanghai Chemical Industry Park Development Ltd., (SCIP), where the world’s leading specialty chemicals company has already established several new operations. Degussa has been producing specialty chemical products in China since the early nineties, with wide-ranging trading relations already in place prior to this. The Group now owns more than 18 companies in the country, with production sites in Anqiu, Changchun, Jining, Liaoyang, Nanning, Nanping, Qingdao, Rizhao, Shanghai and Yingkou. Its broad product portfolio - comprising precipitated silica沈降シリカ, carbon blacks, rubber silanesゴム用有機シラン, amino acids, polyurethane foam additives, coating polyesters, pigment pastes, color tinting systems, high-performance plastics and initiators for plastics manufacture - caters for customers in China and throughout the whole of Asia. The official starting shot for the specialty chemicals group’s currently largest individual investment measure is expected in a few months’ time. The investment volume for the entire plant including all preliminary stages is approx. EUR 250 million. The world-scale plant is to go into operation in the course of 2009, after a construction period of two years. Degussa’s Methacrylates Business Unit is responsible for planning, constructing and operating the plant, which gives it production facilities in Asia, North America, Central and Eastern Europe. The production complex operates on the basis of C4 technology and is being built at Degussa’s multi-user site at Shanghai Chemical Industry Park Development Ltd. The integrated MMA plant is designed to provide an annual capacity of some 100,000 metric tons and to supply raw materials for downstream monomer and polymer specialties for applications in optoelectronics, the adhesives and coatings industries and automotive construction. On late March, Degussa has got finally approval from NDRC for its integrated methyl methacrylate (MMA) project at Shanghai Chemical Industry Park (SCIP), in Caojing, Shanghai. With the total investment of RMB 2 billion (USD 258 million), the proposed project will based on C4 route. Last year, Degussa announced that it had obtained a C4 technology license from a Japanese Chemical company, to use at the proposed Methacrylates site in Shanghai, the estimated output of MMA would be around 100,000 tonne per year. The details for production and MMA technology licensor is not disclosed yet, while according to industrial sources, the integrated project will include a 105,000 tonne/year isobutylene unit, a 115,000 tonnes/year MMA plant, a 15,000 tonnes/year methacrylic acid and 20,000 tonnes/year of butyl methacrylate and a 40,000 tonne/year PMMA unit, it is expected to start up in 2009. Degussa uses the C4 route rather than the conventional ACH route, as this technology is more efficient and environment friendly, that is in accordance with the current environment policies in China. Before, Lucite had commissioned a 100,000 tonne per year MMA unit in SCIP. The Lucite plant is based on the acetone cyanohydrin (ACH) process. It uses the by-product hydrogen cyanide (HCN) from SECCO as the raw material for MMA production. Also, Mitsubishi Rayon Chemcial (MRC) had commissioned a 90,000 t/a MMA plant in Daya Bay, Huizhou, Guangdong Province. The plant is operated by Huizhou MMA Co., a wholly owned subsidiary of MRC. It is based on C4 route. Degussa AG, Business Unit Methacrylates, has obtained a C4 technology license from a Japanese Chemical company. The new technology will be introduced in production at the proposed Methacrylates site in China. Since the beginning of the year, Degussa has been operating a multi-user site at the Shanghai Chemical Industry Park, which would also serve - subject to governmental approval - as the location of the Methacyrylates plant. The license will enable Degussa to increase its technology base needed for MMA and downstream production. Arkema announces the planned acquisition of the PMMA sheet and block production activity from the Repsol YPF group. According to Christophe de Saint Louvent, Group President of Arkema’s PMMA and Methacrylics business, “this acquisition represents an excellent growth opportunity in a segment in which Altuglas International enjoys real expertise. It will allow us to boost our leading position in PMMA sheet in Europe". Repsol YPF’s PMMA sheet and block business currently operates from manufacturing sites in Bronderslev, Denmark, and Polivar, Italy. It employs 125 people, and achieves annual sales of around Euro 30 M.
This acquisition project marks a further step in Arkema’s transformation drive, in particular through its dynamic portfolio management. Altuglas(R) acrylic sheet is marketed essentially for visual communication, sanitaryware, construction, and urban equipment. Altuglas International, an Arkema subsidiary, markets 20% of PMMA (polymethyl methacrylate) world production in the form of acrylic sheet and resin. In this sector, the company operates eight production sites around the world. Its trademarks are Plexiglas(R) in the Americas and Altuglas(R) in the rest of the world. As part of its strategy to develop the PLEXIGLAS® business within the Russian Federation (RF), Evonik Industries and its Russian Joint Venture DESTEK Ltd. have decided to nearly triple the existing extrusion capacity at the companies’ Podolsk production facility. DESTEK is operating currently at capacity and the launch of a second extrusion line will give customers better access to locally manufactured, high-quality PLEXIGLAS® extruded sheets. The capacity expansion will support the business strategy to expand the leadership in quality and to become No. 1 locally in capacity. DESTEK began operating in Russia in 2003. With this announced expansion activities, the company is underlining the importance of its presence in Russia and its faith in the stability and growth potential of the local market. The Plexiglas division of Degussa, which extrudes PMMA sheet, is to begin sheet production in Russia next year.The production should begin by mid-2004. The sheet will be produced by a three-way joint venture company, owned by Degussa’s subsidiary Rohm, and two Russian companies that currently market Plexiglas in the region: Unichem Group and ZAO Orgsteklo. The planned capacity, of several thousand tonnes, will meet demand from both Russia and neighbouring countries in the CIS. Construction of the plant, which will be located in Podolsk in the greater Moscow area, is expected to begin this month.